In statistics, the most often used word is ‘variable’ which refers to a characteristic that contains the value, which may vary from one entity to another. It is similar to the variables used in other disciplines like science and mathematics. The two most common types of variable are dependent variable and independent variable. A variable is said to be independent, whose change influence another variable, while if the variable is dependent, it will change in response to the change in some other variable. The dependence of the former on the latter is being examined by the statistical models. So, here in this article, we are going to discuss some important points of difference between independent and dependent variable. Meaning Independent Variable is one whose values are deliberately changed by the researcher in order to obtain a desired outcome. 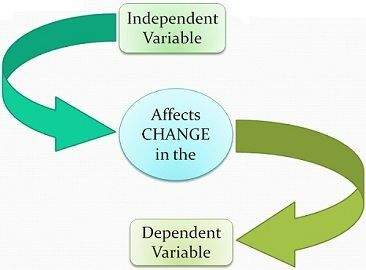 Dependent Variable refers to a variable which changes its values in order to reciprocate change in the values of independent variable. Values Manipulated by the researcher. Measured by the researcher. As its name suggests, an independent variable is one which remains unaffected by other variables. Alternately known as the predictor variable, explanatory variable, controlled variable. It is a variable; the researcher has control over its selection and manipulation, i.e. the levels can be changed. Moreover, its effect on other variables is measured and compared. A dependent variable is a consequence of an independent variable i.e. it is variable that measures the effect of independent variable on the test units. It is also known as the criterion or measured variable. It is something that the experimenter observes during an experiment and is influenced by the experiment. It is expected to change in response to some other factors. The revised value of the dependent value depends on the independent variable. The variable whose values are deliberately changed by the researcher in order to obtain the desired outcome is called independent variable. The variable, which changes its values in order to reciprocate change in the values of the independent variable is called dependent variable. The values of the independent variable can be changed as per requirement, by the researcher. Conversely, the value of independent variables is unchangeable. Manipulation can be done in the values of independent variable, but the researcher observes the value of a dependent variable during an experiment. An independent variable is a presumed cause whereas dependent variable is a measured effect. In a simple linear regression, ‘y’ denotes dependent variable while ‘x’ denotes independent variable, which means y depends on x. There can be multiple dependent variables for one independent variable. In a scientific experiment, the independent variables are controlled or changed whereas the dependent variables tend to be measured and tested. An independent variable is the one that does not rely on anything else and hence can be manipulated, while the dependent shows the effect, of changes made to the independent variable. Very, Very, Very helpful. Broken down and explained to perfection.